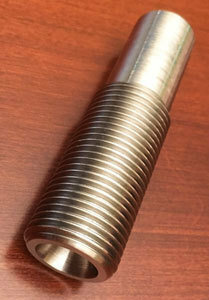 • Standard 7/8" x 14 threads. Works with ALL standard reloading presses, toolheads, and turrets. • Perfect for all calibers from 32 ACP ~ 500 S&W Magnum. The Perfect Crimp secures the top WAD inside the case mouth. run it to the top of the press stroke. you feel it touch the top of the case mouth. 3. Lower the case and adjust the die down about 1/2 of a turn. 4. Raise the case up into the die to process the initial crimp. 5. Adjust as needed. Be sure not to over-crimp your brass. WHY LOAD YOUR OWN SHOTSHELLS? Factory ShotShell Ammunition is expensive and quite often hard to find. Plastic capsules (especially in light revolvers) can move outward during from recoil inertia and may cause your cylinder to lock up. It's FUN and after experimenting with your powder charges and shot size you will be able to create the PERFECT load for your handgun. You may find that larger shot size Buckshot, 4,5,6, etc. may produce wider shot spreads and inconsistent results. WHERE CAN I FIND LOAD DATA? ALWAYS start at the minimum load and work your way up from there. DO NOT USE ShotShells in handguns with ported recoil compensators. ShotShells will ricochet and may cause severe injury or death. ALWAYS APPLY CASE LUBE WHEN USING THIS CRIMP DIE. * We ship the same or next business day.